We’d love your help. Let us know what’s wrong with this preview of The Crystal and the Way of Light by Namkhai Norbu. To ask other readers questions about The Crystal and the Way of Light, please sign up. In my opinion this is simply the most concise, profound, and informative dharma book available in the English language. Fabulous! Rinpoche gives a lot of interesting information about his own life and about how Dzogchen relates to other types of Buddhism. I wouldn't recommend it to someone who isn't interested in the technicalities of Buddhism, though. 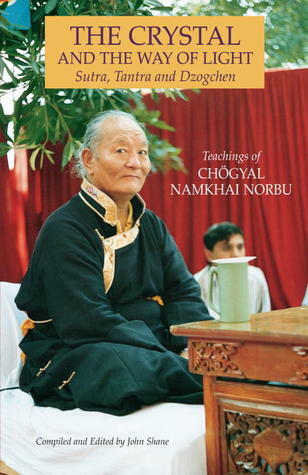 If you practice Dzogchen you must read this book. Invaluable teachings; will have to read again! I believe this to be the best introductory book on Dharma by my root lama. This is a very accessible and straightforward presentation of the basics of Dzogchen contemplation, along with a few stories about different Dzogchen masters (which I skimmed over). A number of simple analogies are presented so that the reader can understand what is needed to practice Dzogchen in their daily lives. For readers lacking sufficient awareness to keep from becoming lost in thought (a prerequisite to Dzogchen), the book lists a number of non-Dzogchen practices that may be helpful to b This is a very accessible and straightforward presentation of the basics of Dzogchen contemplation, along with a few stories about different Dzogchen masters (which I skimmed over). A number of simple analogies are presented so that the reader can understand what is needed to practice Dzogchen in their daily lives. For readers lacking sufficient awareness to keep from becoming lost in thought (a prerequisite to Dzogchen), the book lists a number of non-Dzogchen practices that may be helpful to build attention. Interesante pero no muy preciso, como suelen ser estos libros. Da muchas pautas, muchas que ya había visto. Es interesante el método de dzogchen y ya lo había estado practicando. Quizá solo es cuestión de tiempo y de desarrollarlo más. This is probably available through the post, so you don't even need to go looking. This is a superb intro to Dzogchen for intermediate students! I am grateful for the narratives and the clear explanations in the this book, with context and humor.